Good morning! how's the week treating you? The coffee has been free flowing around here and I'm getting things done. Finally got those deer quilt blocks put in the right order, and I just need to cut some posts today and get the rest of the sashing done. I've also been working on a very fast and fun super secret project, can't wait till that can be revealed! Treated myself to some Vitamin Sunshine and that was great. I love the winter sun, but we really really need the rain! P.S. 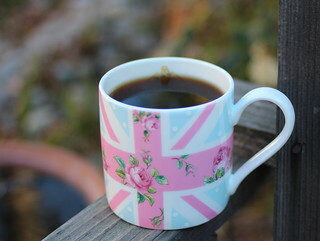 Love Love Love my new mug.. New Country Roses Union Jack mug by Royal Albert. I picked mine up at Amazon after seeing it on the Joss and Main newsletter. I think it was around $11 and I had free shipping with my qualifying order. I saw it for as low as $9 and as high as $27. It's china, hope it can stand up the abuse it's bound to get around here! Just google "royal albert new country roses" and you'll find everything you need! Yes, just the smell of coffee helps me work better in my sewing room, but I then get so involved I forget to drink it while it is nice and hot! Right now I'm working on a 'few' Table Toppers for gifts. Love your Mug - will have to check out the Royal Albert site. Great new mug for 2014! I'm getting my doses of sunshine too, all the while crossing my fingers for rain. This weather is crazy. We need snow here in Colorado. Love the Royal Albert though not much of a coffee drinker. Tea works for me. I'm headed to Amazon now, bc I need the mug, y'know?? Love your new mug!! Royal Albert has the most beautiful china, EVER! Can't wait to see your secret project. oooh - love Old Country Roses - and this mug is perfect! Thanks for the tip! wow--the new Royal Albert line is so pretty--so much prettier (to me) than their old line.